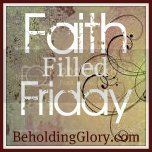 Breathing in Grace: Fantastic Friday - Edition #32!!! Fantastic Friday - Edition #32!!! So many things in my life make it "FANTASTIC"!!! But.....today, I want to share one of the most awesome things that has happened to us recently. I've shared with y'all that our daughter and son-in-law are adopting from Uganda. They had at first asked for 2 children, if there were siblings in the orphanage at the time their 'number' came up. As it turned out, that wasn't what God had in store. Jess had felt for some time that there would only be one child this time (yes, they are planning to adopt again). A couple of months ago, Jess was in what she calls "the girls' room" praying and Sam, our 6-year old GRANDson, came in the room and told her that he would really like to see his baby sister "today". Within 5 minutes....Jess received an e-mail from the adoption agency in the States with their referral. We've since decided that we will give Sam all our prayer requests!!! The picture they were sent was of a precious little baby girl. After our son-in-law got home from work and they had time to gain their composure (after all, this journey has been about 18 months long), they told the lady at the agency "YES"....we want her!!! Even though I cannot share her picture with y'all until they get her back on American soil....just take my word for it that she is beautiful. She will be two years old next week. Her name is Ruby Kate, and she will be called both names....RubyKate!!! That was her paternal GRANDmother's name. This post is not only to share my "FANTASTIC" news, but to ask for prayer. Please keep our precious GRAND-daughter in your prayers. We are so excited to get her home and welcome her into our family!!! I'm hearing next year there might be a Batman, Robin and Bat Girl!!! In HIS Most Precious Love...and with mine!! p.s....don't forget to link up your blog below!!! I am soooo excited and happy for you and your family!! I can't wait for Ruby Kate to be home and lots of pictures to ooo and awwww over !! Keeping them in prayer and waiting for updates.